Next week, there will be an important and telling election in the State of Israel. These days we hear similar words spoken about most elections, but this one has the added attraction of those words being true. Israel and the U.S. are in similar situations, as it seems that those who subscribe to leftist and those who believe in right-wing political and national philosophies are just about split down the middle. 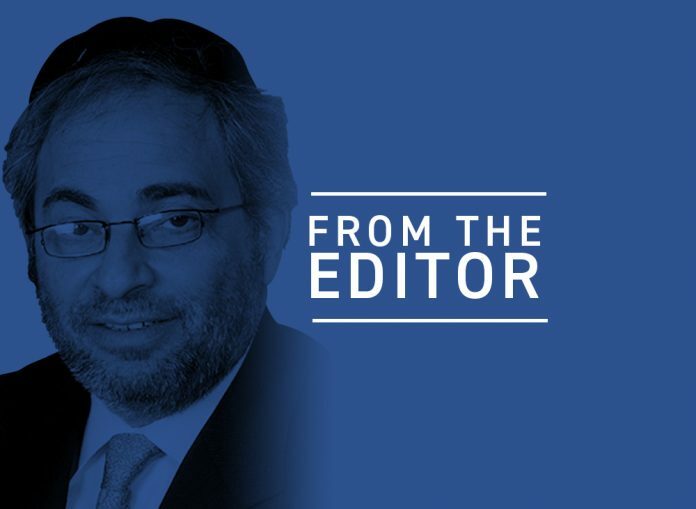 Fortunately, from the perspective of our usual editorial position, we in the U.S. as well as in Israel, while split, feature a bit more of a tilt in the direction of the right. It is not that the left in Israel is bad or has bad intentions. And neither is it a matter of those of us on the right opposing those positions because we just do not agree with them. It is more serious than that because the left, over the last quarter-century, dating back to the 1993 Oslo Accords, has been proven to be wrong. More importantly, at this point in time, the distinct possibility exists that a large block of perhaps even as much as a quarter of the Knesset will be controlled by the religious parties who are part of an organized and unified right-wing bloc. Up to this point and through Israel’s history, the left has always assumed — and was mostly correct — that there would be disagreements and disputes among the religious parties in the Knesset who, for any number of reasons, would just not be able to sit together in a solidly right-wing government coalition. But through a winter of sometimes difficult and contentious elections, agreements have been reached, and the right-wing parties — religious and nationalistic — will hopefully be a vital component of another Likud government led by Prime Minister Netanyahu. The most recent polls show the left-of-center Blue and White Party holding a slight lead over the Likud, filling 30 Knesset seats compared to Likud’s 28 or so. On Tuesday, a poll conducted by Professor Camille Fuchs showed Likud pulling slightly ahead of Benny Gantz and Blue and White. Likud will form the next Israeli government. It appears that Blue and White’s only option would be to form a government that includes Arab members of Knesset, which has never been done in Israel’s history, or form a national unity government with the Likud. Gantz has joined forces with Yair Lapid’s Yesh Atid Party, with the expressed hope of bringing Israel’s politics to the center. Interestingly, one of the issues that divides Blue and White and Likud is the internal matter of egalitarian services for men and women at the Kotel. This may not sound like a matter that affects Israel’s standing in the world, but it is considered a vital issue internally and is watched very closely in Jewish communities here in the U.S. A right-wing government in Israel does not sit well with the majority of the Jewish communities here in the United States. The American Jewish community is diverse, and largely supports mixed prayer at the Kotel, as well as a two-state solution. Just like the Democrats here in the U.S., the fact that their policy positions have demonstrated a serious lack of success does not stop anyone from promoting those previously failed formulas. It has become abundantly clear that unworkable policies are no longer a reason not to try to advance or promote them. And that is as true in the U.S. as it is in Israel. The objective, whether you are Democrat or the Blue and White in Israel, is to get into power—and then there is always time later to adjust, alter, or change those very same policies that got you elected. In Israel, Gantz and Lapid will never form a government with Arab members of Knesset. The Arabs do not hesitate to say clearly that they are in favor of dissolving the Jewish state as we know it. The polls that calculate that Gantz and Lapid can form a majority, or close to a majority, government with Arab MKs are not worth the paper those words are written on. At the same time, as we have written in previous weeks, the left has no problem criticizing the fact that a party like Otzma Yehudit is part of the right-wing parties that would potentially join a Netanyahu coalition. The problem there is that some members of Otzma are referred to as Kahanists and therefore are considered by the left and some of the right to be racists. Rabbi Meir Kahane was not a racist. He loved Israel and Jews and was committed to the survival of both. Those who criticize him are not afraid of Kahanists or racists; they fear success. Israeli politics is a complicated matter. This summer, Bibi Netanyahu will be the longest-serving prime minister in history, surpassing the record held by Israel’s first prime minister, David Ben Gurion. Netanyahu cannot be prime minister forever, but that is not the point. For now, he is doing well and is perfectly suitable to continue, so speculating about the future at this pivotal juncture is just not relevant. Benny Gantz was an excellent military general and chief of staff. He will head up a party that will sit in the Knesset, and will put up numbers in next week’s election that will have him and his party playing an important part in Israel’s next government. But this is not the time for a novice prime minister of Israel. If he were to become Israel’s leader now, it would throw a number of processes off balance. Once again, the Palestinian issue would rise up to the fore, with anti-Israel world leaders like those in Europe running circles around an inexperienced prime minister. For now, it is in Israel’s best interest to stick with the right. It is the good and right thing to do.